The largest mermaid tail rental inventory West of the Mississippi River! We place safety first to keep your shoot on schedule with the stunt professionals that you need to stay on time and on budget. Need to hire underwater photographers, underwater videographers, underwater hair and makeup artists, trained underwater models, SCUBA Rescue Divers, underwater assistants, set EMTs, or certified surface support lifeguards for your water shoot segment? Good call. We have those too and can provide quotes as a package to reduce your planning stress. Surgical grade silicone and fabric mermaid seashell, scale, and starfish design bra tops located near Los Angeles, California and the Hollywood film radius. Sizing: 32C/D, 34A/B, 34 C/D. Contact us for photos based on the size needed. 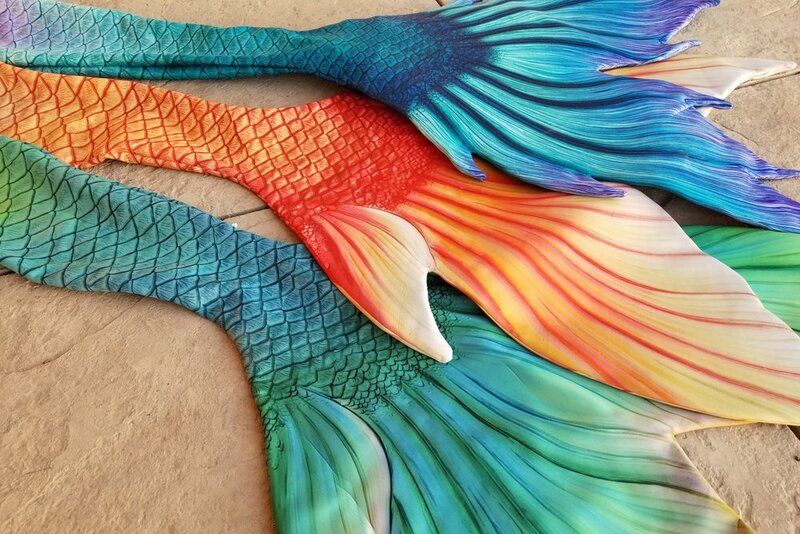 Pricing averages $1,200 for a four hour shoot for each silicone level mermaid tail + top rental. This package is only for projects that involve your own model sitting out of water or in no more than 6" of water depth. Any swimming or attempts to swim in this costume with this non-swimming package is grounds for contract termination without refund. A mermaid tail wardrobe expert is included in this rental price. The wardrobe expert is responsible for delivering the tail to / from set, assisting the model with properly getting the tail on/off, and supervising the tail's safety on set to prevent damage and/or misuse by production. Sizing: Waist sizes from 23-30", hip sizes from 32"-37", most tails are for people 5'4"-5'10" tall. Colors vary by size needed. A sample of a mermaid silicone (prosthetic level) tail rental with a silicone bra top rental. Surgical grade silicone mermaid tails for film and commercials located near Los Angeles, California and the Hollywood film radius - delivered straight to your set! Sizing: Waist sizes from 23-30", hip sizes from 32"-37", most tails are for people 5'4"-5'10" tall. Contact us for photos of available tail rentals based on the size needed. Priced based on project stunt requirements, duration, and usage. Swimming tails are ONLY available for rent when worn by one of our on staff trained mermaid stunt performers OR when combined with a pre-shoot swim training day AND hiring OUR own underwater mermaid modeling trained SCUBA safety divers... it doesn't matter if your venue has safety divers. We still need to send our own divers along as they have specialty training not covered in standard rescue diver or instructor courses. Please check out our performers page for bios and photos of our current water staff. Yes, SAG-AFTRA and non-union underwater talent is available from our company. Yes, our costumes are ok for aquarium work as they meet animal husbandry design and safety requirements for zoos and aquariums. Need A Pool Rental Too? Click Here. Neoprene and Silicone mermaid tails are fragile, fully sealed, custom-fit prosthetic costumes designed for 5'2"-5'10" heights and are NOT size adjustable. Please pick the tail BEFORE you cast for a model as models are easier to find in Los Angeles than prosthetic tails! If your model is larger than our tails then you will be out of luck and will need to remove them from your project to replace them with a thinner model. Mermaid tails and tops are not allowed to be repainted, punctured, "altered," or modified by wardrobe personnel in any way. Color choice is subject to availability and size needed. These costumes cannot be altered / adjusted to fit a person, the person needs to fit the costume (or be smaller than the costume) to be able to get it on without damage. Tails are only for use around clean, filtered tap water or similar. They may not be placed in dye, slime, sewage, lake or river water, and/or food products (e.g. Jello). 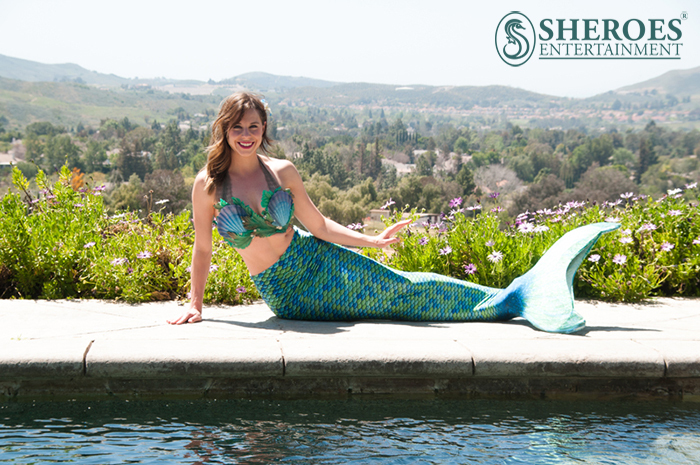 If you are a production unit and are in need of a mermaid tail rental on one of our professional mermaids please call us at (805) 328-4911 with the following information on your filming date(s) or contact us via our web form.